Agents for Change across five continents will join hand in hand for Fair Trade and the Planet to celebrate World fair Trade Day on 13 May 2017. Join us and be part of the movement by sending out a fair trade greeting card to someone you have been thinking about lately. This year we made joining in easier than ever, offering a 25% discount on all of FairMail’s fair trade greeting cards. Just enter WFTD2017 in the discount code field at the end of placing your order and you will receive the discount (without affecting the earnings per card by the teenagers by the way!). 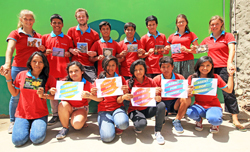 The FairMail Peru team has also been part of the preparations for World Fair Trade Day. Contributing their Agents of Change photograph and video to the WFTO’s campaign.